It looks more sinful than it is, really. 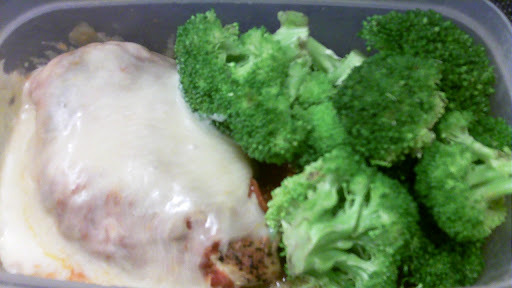 Grilled chicken breast, 1/2 cup marinara, 1/4 cup lowfat mozzarella cheese, and broccoli. That does look good, isn't it nice when you can have great tasting, good for you food that looks awesome too? My dinner was cauliflower and carrot soup. quite good but not very pretty.